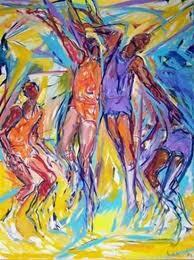 The joy of ballet, basketball and art!! Edgar Degas (1834-1917) was one of the founders of French Impressionism. He was especially identified with the subject of the dance, and over half of his works depict dancers. Elaine de Kooning, born the year after Degas died (1918) was an Abstract Expressionist artist who was famous, among many other areas, for painting abstract basketball players. Degas and de Kooning portrayed their athletes with the beauty of the “dance” as well as their focus, their grace under pressure; their grace under pain. Both ballet and basketball demand daunting feats of their dancers and players. Both must jump, run, spin and maintain balance. Both drive the body beyond natural limits year after year and perform through constant pain and injury. The great ballerina and the great basketball player must have leadership abilities combining their extraordinary talents with deep humanity. In 1993, ballerina, Janie Parker, ended a brilliant career at the Houston Ballet. With tears streaming down her face in gratitude, this astounding dancer was given a standing ovation by the audience, which lasted a half hour. The next day, on Father’s Day, after the Chicago Bulls won the National Basketball Championship, Michael Jordan broke down and wept for the memory of his murdered father, displaying to all the world his remarkable humanity. Grace under pressure; grace under pain. View videos for Ballet and Michael Jordan’s greatest moments! Ballet video. Click here if unable to view the video. Michael Jordan’s Greatest Moments video. Click here if unable to view the video. Kirby, great blog/another great blog. My favorite art form -impressionism. 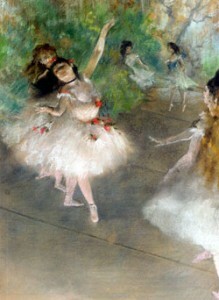 Degas in near the top of my list – love his art, love his subjects. Classical ballet is beauty – a form of beauty that is visual, represents commitment, physical discipline, and talent. What else is needed to stimulate the mind and soul? As for successors of his school of art, I am happy with it, but prefer the real thing. This is a beautiful message. Grace under pressure, grace under pain. Too many times people lash out at others when they have pressure or pain, instead of learning grace.